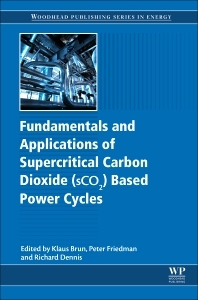 Fundamentals and Applications of Supercritical Carbon Dioxide (SCO2) Based Power Cycles aims to provide engineers and researchers with an authoritative overview of research and technology in this area. Part One introduces the technology and reviews the properties of SCO2 relevant to power cycles. Other sections of the book address components for SCO2 power cycles, such as turbomachinery expanders, compressors, recuperators, and design challenges, such as the need for high-temperature materials. Chapters on key applications, including waste heat, nuclear power, fossil energy, geothermal and concentrated solar power are also included. The final section addresses major international research programs. Readers will learn about the attractive features of SC02 power cycles, which include a lower capital cost potential than the traditional cycle, and the compounding performance benefits from a more efficient thermodynamic cycle on balance of plant requirements, fuel use, and emissions. Dr. Peter Friedman is a mechanical and nuclear engineer at Newport News Shipbuilding, a Division of Huntington Ingalls Industries. During a 20 year career in the United States Navy, Dr. Friedman served as a submarine officer, where his assignments included engineering department head on board the nuclear submarine, USS Hyman G. Rickover and mechanical engineering professor at the United Sates Naval Academy. Following retirement from the Navy, Dr. Friedman entered academia at the University of Massachusetts Dartmouth and was elected Chairman of the Department of Mechanical Engineering. He was selected as a Legislative Fellow by the American Society of Mechanical Engineers, where he advised Congressman Mike Simpson on energy and defense policy issues. Dr. Friedman earned a Bachelor's and Master's degrees in Mechanical Engineering from Georgia Institute of Technology and his PhD from Johns Hopkins University. He is a licensed professional engineer, registered in Virginia and Massachusetts. Mr. Richard Dennis is currently the Technology Manager for Advanced Turbines and Supercritical Carbon Dioxide Power Cycle Programs at the U.S. Department of Energy's National Energy Technology Laboratory (NETL). These programs are multi-million dollar per annum R&D activities managed for the US. DOE Office of Fossil Energy. The programs support university, industry and U.S. national laboratory research, development and demonstration projects. Rich has a BS and MS in Mechanical Engineering from West Virginia University. From 1983 to 1992 Mr. Dennis worked in the on-site research group of NETL where he conducted research related to pressurized fluidized bed combustion, gasification and gas stream particulate cleanup for advanced coal based power generation. From 1993 to 2000 Mr. Dennis managed contracted research for the DOE Office of Fossil Energy in advanced fossil fuel power generation including coal combustion, gasification, fuel cells, and gas turbines. In 2002 Richard was selected as the Turbine Technology Manager. In 2014 – 15 Dennis served as the technology manager for the DOE FE Advanced Combustion Systems technology area. Currently Richard is serving as the Technology Manager for Advanced Turbines and Supercritical Carbon Dioxide Power Cycles programs at NETL.